Today's featured artist is a colorful character: Lar DeSouza! Lar's the artist for the upcoming Munchkin Playmat: Spyke's Christmas Wish and next spring's Super Munchkin Guest Artist Edition*, so I thought I'd talk to him about his super art and his own personal super heroics. Hi, Lar. Thanks for taking time from saving the world to speak to me today! Prior to working on Super Munchkin Guest Artist Edition (and Munchkin Playmat: Spyke's Christmas Wish), had you played Munchkin? Yes! I bought the basic set and expansion years ago. I've been a fan of John's work, and SJ Games, for a long while. 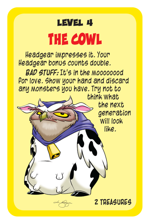 When you were illustrating your own Super Munchkin, did you look at John Kovalic's version, or did you go in blind? It was tempting to go in blind, but I did look at John's work. It was unavoidable, really, since the card list I was sent was the pdfs of the decks. I did try to not duplicate John's layouts. What is your favorite card from the set? That's a hard call! 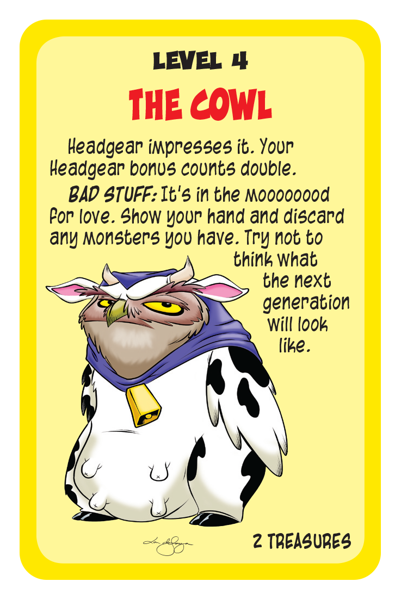 I had a lot of fun, especially with the gadgets, but I think The Cowl might be my fave in the deck. Telekinesis. Yeah, I had that answer chambered. Not the first time I've dreamt about it. I'd never forget my coffee in the other room again! You've done a lot of work promoting awareness and finding a cure for MS. What drives you to support this cause? My wife's best friend from university (also godmother to our eldest) was diagnosed in her final year of Teacher's College. She is an amazing person who continues to work full-time as a high-school drama teacher. A few years ago, my wife decided to participate in the annual MS 10K Walk For A Cure. The website suggested a single walker try to raise "$100." I said "Screw that noise!" and appealed to the readers of my webcomics. They blew us away with their support – or possibly they just like abusing me. Fortunately, as I am a cartoonist, I have no dignity so it's a win-win. 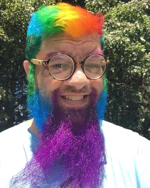 What is the best way for someone to help support an MS charity? Obviously, the first way is to simply donate what you can to your local MS foundation. It's tax deductible, too! You can also participate in any of their annual fundraising drives, like the Walk For A Cure. It's an incredibly exciting time for researchers. There are increasing crossovers for therapies, too! Research for cancer can help arthritis. A study for arthritis also helps MS. New MS drugs help Parkinson's, etc. Fantastic! Thanks again for speaking to us, Lar! How can fans follow you online? Aside from my two webcomics, Least I Could Do and Looking For Group, I'm most often found on Twitter @lartist, where I post pictures of my cats and random cartoons. * Look for Lar's Munchkin Playmat: Spyke's Christmas Wish later this year, and Super Munchkin Guest Artist Edition in spring 2017!